I was with Nicaraguan Uriel Carazo who was travelling in the United States to speak about how the Central American Free Trade Agreement (CAFTA) was exacerbating already dire conditions in Nicaragua and pushing people to look for economic alternatives - mainly, of course, via migration (see video below of his talk at Occupy Wall Street in New York). With all the buzz around the subject, particularly in GOP debates, you’d figure folks would be keen on hearing what Carazo had to say about why people were migrating. 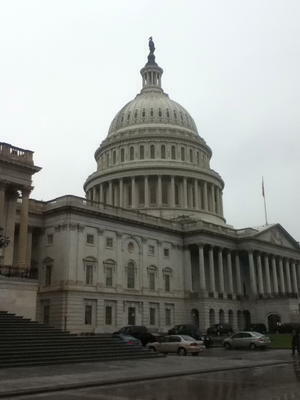 On that rainy Washington morning, we were there to meet with the offices of Rep. Katherine Castor (D-FL), Rep. Albio Sires (D-NJ), and Dennis Cardoza (D-CA). Problem was, they didn’t seem too interested. In Sires office, we didn’t even get past the couch in the waiting room. Trade agreements, especially after the ‘uncontroversial’ passing of the Colombia, Panama, and Korea FTAs in October, couldn’t be further off the congressional radar. Castor, Sires, and Cardoza- all Democrats - voted for the bill. In their offices we ran into the typical Washington portfolio problem - the trade person tells you to talk to the immigration person, and the immigration person tells you to talk to the trade person. Problem was, it turned out, we were in the wrong debate all together. The connection that Washington made with migration was with militarization, not trade. This we probably should’ve known, in October Republican candidate Herman Cain brought up the possibility of electrifying the fence along the U.S.-Mexico boundary. Though Cain later apologized for this, his response was on-line with Washington’s border and immigration policy. It really wasn’t so far-fetched. On that same very rainy day, down the street from where we were, the Department of Homeland security issued a notification that it would be requesting proposals for its integrated fixed tower program from the private sector. This is the resuscitation of the “virtual fence” on the U.S.-Mexico border, a project that was temporarily disbanded last year when it was known as SBInet- the application of advanced surveillance and computer technology to border enforcement, an invisible wall that officials hope has the same effect as a real wall in rural areas near the U.S.-Mexico boundary. In 2006 the three year multi-billion dollar contract went to Boeing Corporation, but its equipment didn't work properly. Now DHS requires that the equipment be able to detect a single, walking, average-sized adult human at a range of up to 7.5 miles. University of Texas El Paso anthropologist Josiah Heyman described the virtual wall in broad terms as a continuation of the strategy of “massing of police forces, including military and intelligence agencies, in the border region,” and that all walls “physical and technological” need to be understood as part of this wider development. In the absence of any guiding comprehensive immigration reform, all debates always end up with this sort of militarization as the solution. Thus, this becomes the answer to the migration-free trade “problem”. The fundamentals of this free trade problem in Nicaragua, Uriel Carazo told congress members, were the privatization of basic services, the low wages and employee abuses in the free trade zones- especially in textile and tobacco factories, and small farmers going bankrupt. “It is these conditions,” he told the representatives, “that are driving people north.” Small farmers who could no longer make it sold their land to finance their journey. 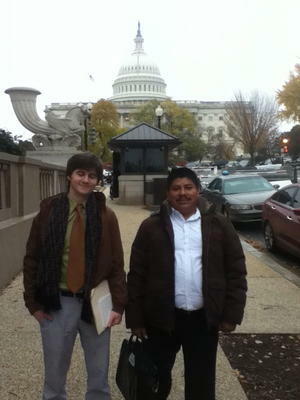 Uriel Carazo and Riahl O'Malley from Witness for Peace. But Washington, Heyman wrote, has moved “. . . to transform border issues into security issues" and this is "highly contested and contradictory." He said that the United States has arrived to this point because of “insecure prosperity” and “clinging to order” in a world of vast inequalities. Two fundamental ways in which arising concerns are expressed are through “citizenship differences” in which citizens, or “deserving insiders,” are pit against “serving (but not deserving) outsiders”; and flat out racism against Latino/as, especially Mexican and Central American migrants. With one “rigid and coercive mechanism” border policy attempts to solve these problems that are socio-economic at root. Carazo fleshes out this analysis even more by stressing that free trade agreements such as CAFTA both exacerbate these vast inequalities and create countless socio-economic problems in Nicaragua. The walls and militarization are less between countries, Carazo seemed to say, and more between the economically rich and poor. Maybe this is the real logic behind the Washington immigration narrative.